I’ve been having a great time sharing smoothie recipes with my Juggling Real Food and Real Life Smoothie Competition. I am really excited to share another recipe today. I would like to introduce you to Nicole from 365 Days ish of Pinterest. If you are as obsessed with Pinterest as I am, you are going to love Nicole’s blog. Her personal motto is “Don’t pin it unless you’re going to try it.” She has tried new pins for 365 days straight and loves it so much, she can’t stop. How fun! 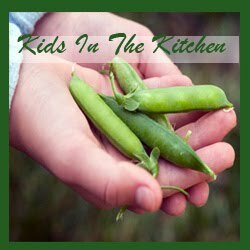 Stop by and visit Nicole’s blog and tell her Juggling Real Food and Real Life sent you. Nicole is the mom of three happy boys, Bryce, Henry and Charlie. 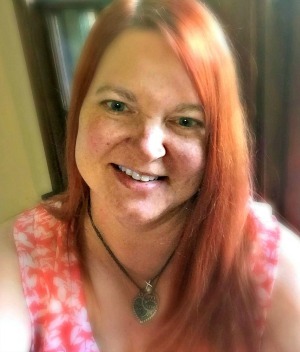 She is a Christian, a wife, a mom, a piano teacher, and now…a blogger. In June of 2012 she started her blog on a whim. Nicole “discovered” Pinterest a few months before and was having such a great time trying lots of pins. The only problem was that she couldn’t keep track of which ones she had done. And somehow, the thought just popped into her head, I should start a blog to keep up with all of this. And just to make things almost impossible, she decided she would try a new pin every single day for a year. Thus, the premise of her blog was born. And without any planning or research whatsoever (something she DOES NOT recommend) she just typed up her first post and hit Publish. Now she has 365 days of pinning and posting done and she is looking forward to Volume number 2. Don’t forget……….the winner of the competition is determined by the recipe which has the most votes. A vote is a written comment at the bottom of the post. Read the post, leave a comment, cast your vote and………best of all…….try the recipe. Escape to a tropical island with this refreshing blend of pineapple, strawberry, banana, orange juice and yogurt. Well, at least pretend you can escape from that every-growing pile of laundry that’s starting to eyeball you menacingly. I was craving something sweet last night, so I whipped up this tasty smoothie. I must say, it tasted just like Juice it Up! They were giving away free smoothies for moms on Mother’s Day, and I wanted one SO BADLY, but I just didn’t have enough time to get one made before I had to be at choir practice. I even stood in line and ordered, but as time ticked away I had to cancel my order and leave empty-handed. Poor me. BUT, satisfaction and redemption at last! (Two whole days later.) I was pleasantly surprised at how easy this was to throw together and how yummy it turned out. 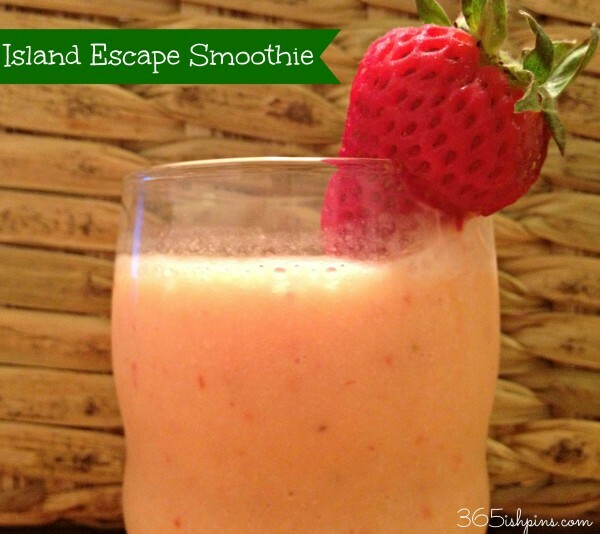 This smoothie would be a great addition to a summer luau or backyard BBQ! Add the ice, pineapple, bananas and strawberries to the blender, process until smooth. (My blender is on death’s door, but it still managed to whip this up quite well-I’d love to see how frothy and smooth you could get it with a healthy new blender. Pour in yogurt and orange juice and continue to blend until mixed well. Pour into glasses and serve immediately. Garnish with strawberries or pineapple chunks. Now it’s your turn………..leave your comments below and cast your vote for Nicole’s Island Escape Smoothie. Nicole needs a new blender……..do you have a favorite brand to recommend? Do you like your smoothies frozen or just nice and cold? Thanks to Nicole for sharing her recipe with us today. You can find this recipe and more on my smoothie Pinterest board. I think it's an easy preparation. Anybody can prepare it in their home easily. For summer season it's fantastic. Its higher water concentration is good for health. Easy recipes are my favorite! You are so right. I think it looks just beautiful as well. Very fun for summer. It's great to have you visiting with us today Nicole. I'm looking out for you with that blender. LOL! It sounds good. I'm going to make it this afternoon with one change. I plan on using frozen pineapple tidbits which I use a lot in my smoothies. Thanks for posting. I love the frozen pineapple idea. That would be perfect! Enjoy your refreshing island afternoon. I hope you come back to visit us here often. This smoothie sounds so delicious and refreshing! I love my blendtec blender, and recommend them to everyone. We got ours several years ago at Costco. We had to save up for it for quite a while, but I'm so glad we did! I love this delicious smoothie! Easy to throw together and tastes fantastic! Reminds me of Hawaii. 🙂 Thanks for sharing Nicole! I thought the same thing. My trip to Hawaii is full of great memories and island drinks are one of the best memories. Thanks for stopping by and placing your vote for Nicole. I hope you come back to visit us often. Thanks for stopping by and placing your vote for Nicole. I hope you come back and visit often.